And very yummy for my tummy! A few of you saw the picture on my FaceBook page and asked me to post it. For credit purposes, I found this recipe on Pinterest....and have added a few notes at the bottom of the recipe for what I'd do differently next time we make it...and there will definitely be a next time! Add Balsamic Vinegar to a small saucepan and bring to a bowl. Reduce heat to low and simmer until reduced by half. Remove from heat and allow to cool. Add minced garlic to butter and mix until well blended. Cut the loaf of bread in half lengthwise. Butter the cut sides with the garlic butter. 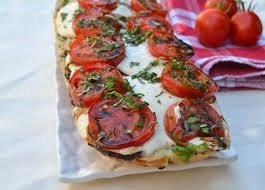 Place the mozzarella cheese slices on top of the bread evenly. Bake for about 12 minutes, until the cheese is melted and the edges are starting to brown. Top with the sliced tomatoes, chopped tomatoes, and salt/pepper to taste. Drizzle with your Balsamic Vinegar reduction sauce. - Use Ciabatta bread...not so much fluff. - Add more garlic (we're garlic fiends here). And it will be made again in this house!